Black tea is different from normal tea leaves and is prepares from the leaves of a special variety of tea plant. It has a strong flavor and is excellent for your health, skin and hair. If you have puffiness under your eyes, place tea bags on them and it will reduce the puffiness. Presence of caffeine in black tea helps in killing oral viruses, giving you a blemish-free skin that is free from any infections. Tannins present in black tea increases blood circulation and protect your skin from various skin diseases. You will get a glowing and blemish-free skin by drinking black tea daily. Black tea is very effective in treating pimples and pre-mature ageing of the skin. Drink two cups of black tea every day and you will see the results. When you go out in the sun, apply the extract of black tea on your skin, it is very effective in protecting your skin from the harmful effects of the sun. Black tea contains antioxidants, which is very effective in preventing skin cancer. Black tea may be used a natural dye by those who have dark black or brown hair and want to hide some of their grey hairs. It makes your hair look dark and also add shine and luster to your hair. Black tea helps in increasing your hair growth and lowering loss of hair. This is because caffeine present in black tea decreases DHT, a hormone present in the scalp, which is responsible for hair loss. Rinsing your hair with black tea provides you with lustrous hair that is naturally dark. Put three bags of tea to 6 cups of boiling water and cool it at room temperature for 1 hour. Now pour this on your hair and wrap your head with a towel. After 1 or 2 hours, you may wash your hair. Black tea is good for your digestion because of the presence of tannins in it. Tannins with its therapeutic effect help in treating intestinal and gastric ailments. Black tea is also good for those suffering from irritable bowel syndrome, as the polyphenols contained in it reduces intestinal inflammation. To fight against bacteria, virus and other such organisms that cause illness, you need to have a strong immune system. There are substances called tannins in black tea, which act against the harmful actions of the viruses that cause influenza, dysentery, flu and cold. Catechin is such a tannin that can fight tumours. You can get rid of the pathogens from your body by drinking 3 to 4 cups of black tea daily. Black tea is great for treating cardiovascular problems. It contains anti-oxidants like flavanoids, which has the ability to prevent the oxidation of the bad cholesterol, LDL. It also prevents damages that may occur on artery walls and saves you from various heart diseases. It is beneficial for the dilation of coronary arteries and prevents clotting of blood. Black tea also contains manganese and polyphenols, which enhances cardio muscle function and prevent coronary heart disease. Black tea is rich in polyphenols, which are anti-oxidants that prevent the occurrence of carcinogens in the body, thus helping in the prevention of various cancers of lungs, prostrate, ovary and bladder. The compound TF-2 present in black tea kills cancer cells, leaving the normal cells unaffected. Those who constantly use cigarettes and tobacco are at a risk of getting oral cancer, which can be reduced by drinking black tea. It also checks the formation malignant tumours and its growth. Presence of free radicals in the body leads to several health hazards like blood clotting, atherosclerosis, cancer and so on. Black tea is rich in antioxidants, which help in removing the free radicals from the body. It prevents you from getting affected by Alzheimer’s and diseases of the heart. Black tea to which lemon juice is added is more effective. Black tea contains sodium, fat and calories in very low quantities. So it is very helpful and effective for those who want to lose weight. It also increases the metabolic activities, thus helping you lose weight. According to the research conducted on black tea, it is found to be good for your bones and connective tissue and keep them strong and healthy. The caffeine present in black tea is in moderate amounts and it is more stimulating than the caffeine in coffee or cola. It provides you more energy and makes your brain more sharp and alert. You can prevent oral cancers by drinking black tea, because of the presence of catechin in it, which is an antioxidant. The presence of tannins and polyphenols prevent decaying of the tooth with their antiseptic properties. Fluoride is also found in black tea, which prevents bad breath and also removes harmful bacteria from the mouth, preventing tooth decay. You get 1.5 mg of fluorides by drinking 2 cups of black tea every day. 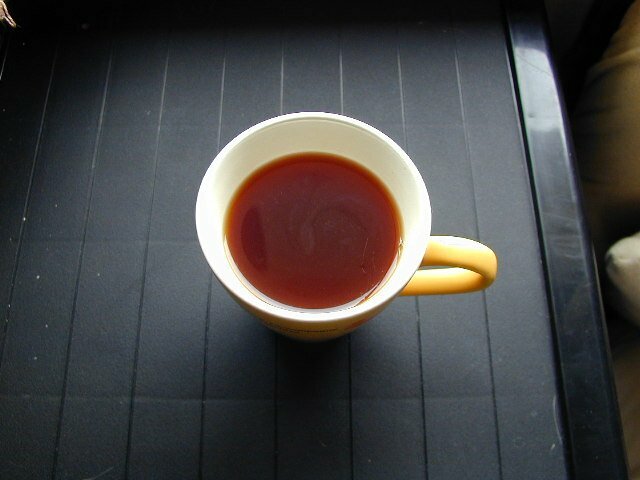 Caffeine is found very less in black tea than in coffee. This small amount of caffeine present in black tea increases the flow of blood in the brain and increases your concentration abilities and mental alertness. Black tea contains and amino acid called L-theanine, which helps you to concentrate on what you are doing, without any stress. It is also said that regular consumption of black tea can save you from Parkinson’s disease. I never thought black tea could have so many benefits, especially regarding hair treatment. Thanks for sharing!